A Cezanne painting stolen in a raid on a Swiss museum in 2008 has been recovered in Serbia. Authorities have not named the painting, but local media have reported it is The Boy in the Red Vest, which was taken from Zurich's Emil Buehrle Collection. Police said three people had been arrested in connection with the theft. It added an art expert was being flown in to confirm the authenticity of the 1888 painting, worth $109m (£68.3m). The robbery at the Zurich museum was one of the biggest art thefts in Europe at the time. The heist was conducted by three armed, masked men who witnesses said spoke German with a Slavic accent. The Boy in the Red Vest was stolen with three other masterpieces by Claude Monet, Vincent van Gogh and Edgar Degas. Monet's Poppies near Vetheuil and Van Gogh's Blooming Chestnut Branches were discovered undamaged in a car parked outside a psychiatric hospital in Zurich soon after the robbery. The Degas painting, Ludovic Lepic and his Daughter, is still missing. Police said the recent arrests in Belgrade and Cacak were conducted in co-ordination with police from several European countries. Serbia's state prosecutor is expected to issue a statement on the case later on Thursday. 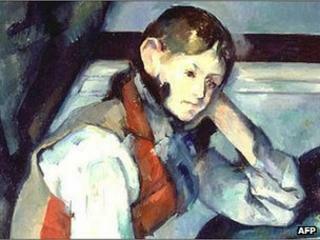 Cezanne's Boy in a Red Vest depicts a boy in traditional Italian dress. Three other versions of the painting are in museums in the US.